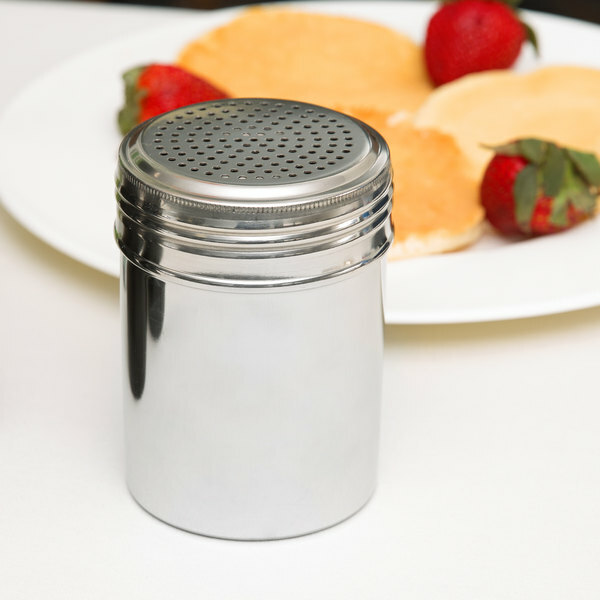 Give guests at your pizzeria, coffee shop, diner, and virtually any other operation the sugar, spices, and other condiments they crave with this sleek, durable stainless steel shaker! Featuring a screw-on top for simple filling, this 10 oz. dredge is sure to be a staple in the kitchen, at self-serve condiment stations, and even on tabletops. Nice matte material, though it is not very thick or sturdy. The lid can be a little difficult to screw on but a big deal, works perfectly for garnishes. perfect for powdered sugar. I use it to sprinkle powdered sugar over desserts. Can be used for other things, but works great for this. I like that it's stainless steel. We love the clean stainless steel look. We use these for powdered sugar and they work great with no clogs and are easy to clean! We purchased for use in sprinkling cinnamon, but quickly realized we needed to upgrade to the sifter. The product is fine , it’s just for use in smaller quantities. These work great for cinnamon at our coffee station! They look classic and simple...which complements our sugar pourer well! We labeled them and customers love using them. 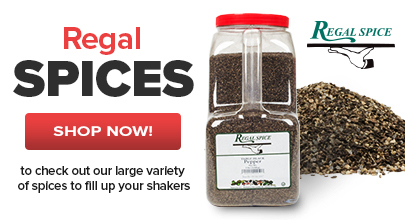 These shakers work great for dispensing powders that clump like chicken boullion or garlic powder. We use ours to sprinkle seasonings during stir frys on the stove or griddle. This shaker fits the plastic lid from the 10 oz mesh shaker. It would be nice if the lids were available separately. 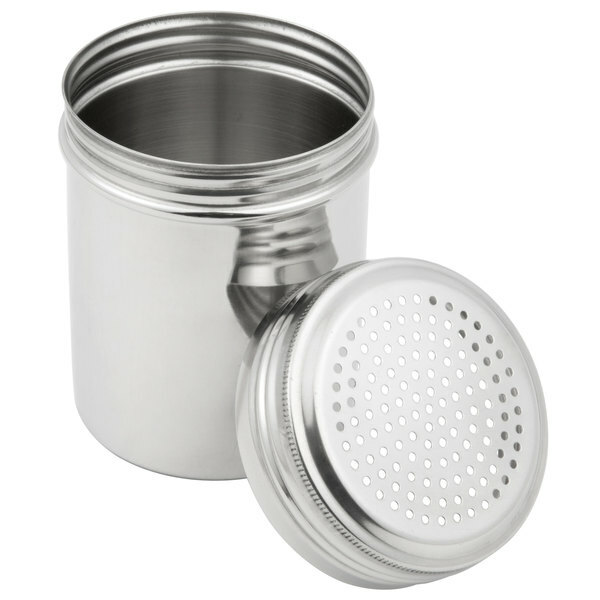 I use this stainless steel shaker for a variety of spices but I mainly use it for cocoa, cinnamon, and powdered sugar. 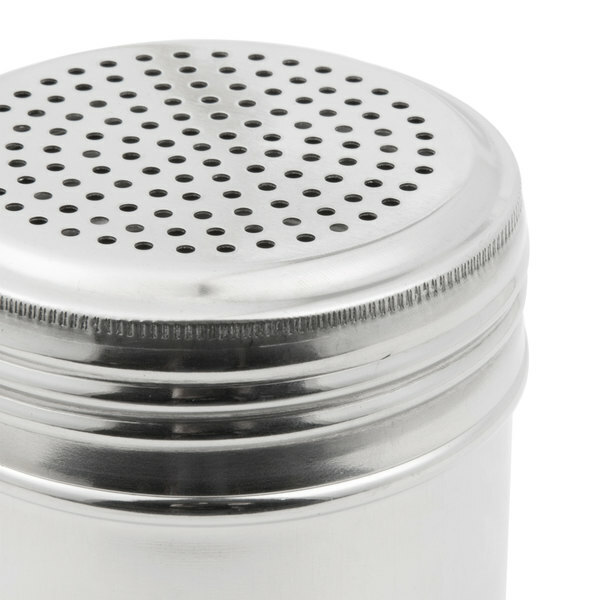 It has a big opening so it is very easy to fill with other spices and also really easy to clean. This order arrived just in time for my holiday catering event. I like the stainless steel for the look but at the same time it shows greasy finger prints easy. However, the grease wipes off well also. So far I really like this for a 10oz shaker. 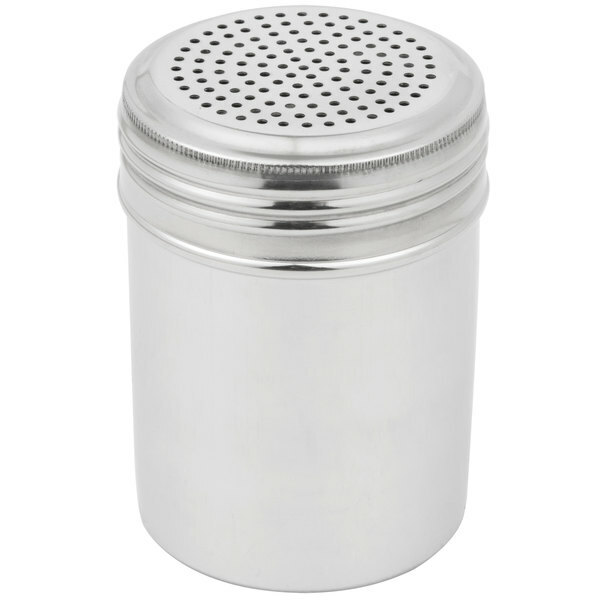 This is a great shaker to use for dredging food with powdered sugar. It is easy to fill and the powdered sugar comes out perfectly. The size is also nice and it is not heavy at all. I wish it had a lid so I could store it with the powdered sugar inside. My life as a baker was make a lot easier when i bought this shaker for putting Powder sugar on my baked goods or french toast. Great for using powder sugar on cakes and baked goods. Love the size and we'll made quality of the Shaker. Great a few to add extra seating to any dish. Works well, hard to tell what's inside unless it's labeled or you are not using more than one. Only downside...our restaurant is at the. Each and holes get clogged a lot with product from the humidity. The stainless steel shaker has a nice weight to it I like that there is no handle makes easier to clean. I think you have more control over the shaker compared to the one with the handle. 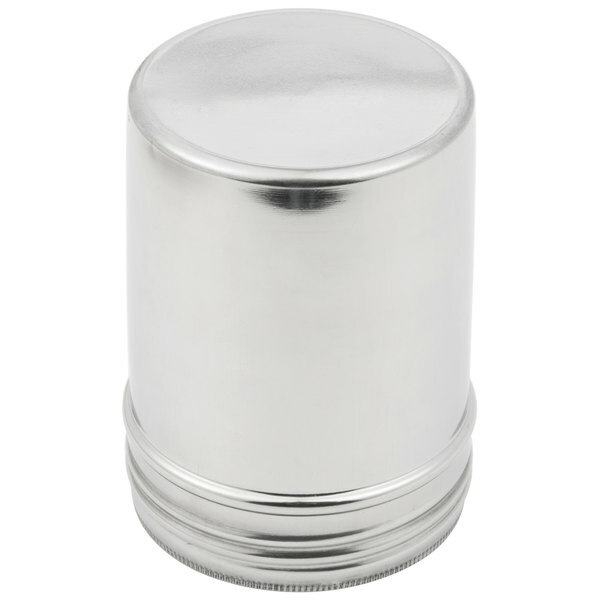 Nice sturdy stainless steel shaker without handle! 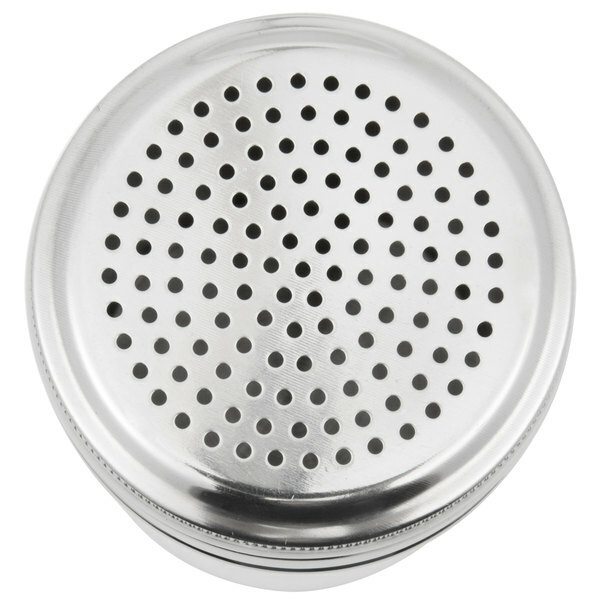 Easy off lid for quick refilling and product doesn't clump. 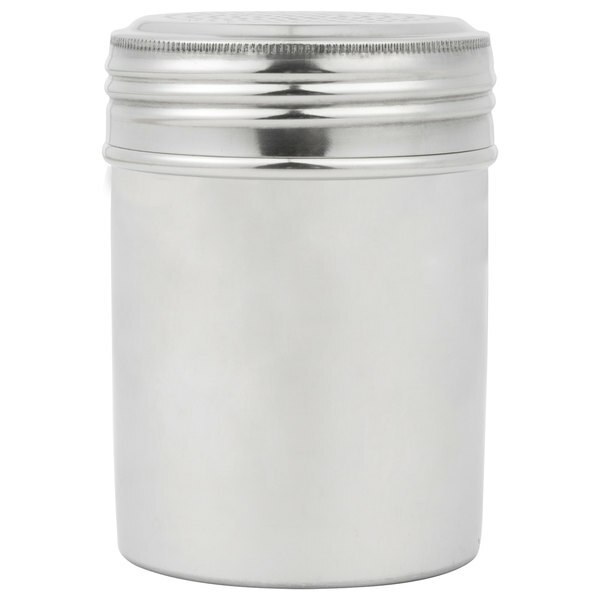 Can be used for powdered sugar, cocoa or spices. I have 3 of these in my bakery. One for confectioner's sugar, one for cocoa, and one for a cinnamon/confectioner's sugar mixture. Good quality and easy to clean.